The best location for Google ads varies from page to page, depending on content. Certain locations tend to be more successful than others. 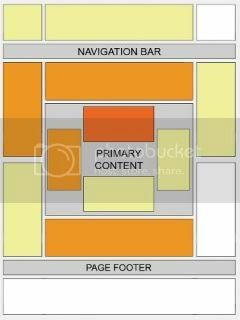 This "heat map" illustrates the ideal placing on a sample page layout. The colors fade from dark orange (strongest performance) to light yellow (weakest performance). All other things being equal, ads located above the fold tend to perform better than those below the fold. Ads placed near rich content and navigational aids usually do well because users are focused on those areas of a page. While Im no expert on this, new bloggers should try various combinations/placemenst for a week each maybe and see how they perform. I am getting Public Sectors Ads in my blog...........reason being: Google says I need to add a PIN no for verification purpose which they will mail me at my home...........any idea whats going on? Me too had problem somewhat like you. Then I updated my whois information so that the address I used while submitting request to Adsense must be same as that whois shows for your website with correct pincode. now thats a choice between neat blog layout vs some extra money... after chkng out this i realized now y my google adsense account has just a few $ in years..